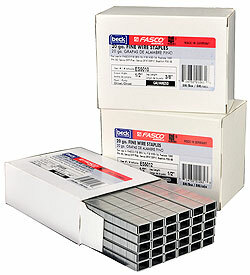 Senco F type crown staples by Fasco. 1/4-inch length, 1/2-inch crown, 20 gauge. Chisel point. Galvanized. 5,000 staples per box. Made in Europe. Fits Senco SFW10XP-F, Bostitch P50-5B, Salco SP50-5B, Bostitch P51-5B, FASCO F1B SR5-16.